people in London are in a household in poverty after housing costs, compared with 21% of people in the rest of England. the proportion of people in poverty in London was two percentage points higher at 29%. This figure has been slowly but steadily declining over the last number of years. However, because London’s population has grown, the number in poverty remains at 2.3 million. of Londoners in ‘deep poverty’ has increased over this time period. 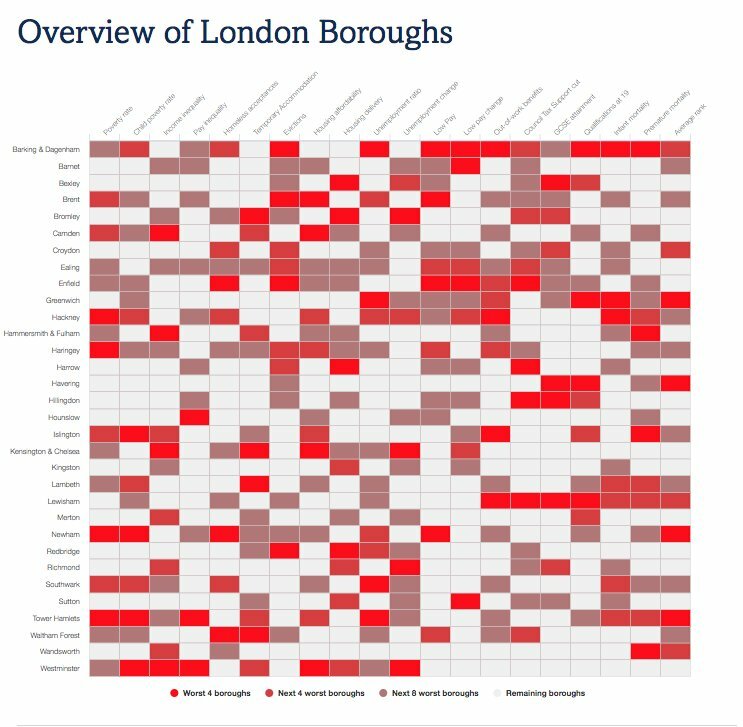 This graph looks at the changing picture of poverty in London. On average in the three years to 2015/16, 27% of people in London were in a household in poverty after housing costs (AHC). This is equivalent to around 2.3 million people. 21% of people were in households in AHC poverty in the rest of England. On this after housing costs measure, the poverty rate in London has fallen slightly: down two percentage points from 29% in 2007/08. The number of people in poverty in London have been largely unchanged over the last six years, although this is in the context of a growing population. Between 2008–11 and 2013–16, the increase was less than 20,000 and not statistically significant. The BHC measure includes housing benefits as income and does not deduct rent. In London, where housing costs are higher, housing benefits can make up a significant part of a household’s income despite it going directly to the landlord. A household in London receiving a large amount of housing benefits for their rent will appear to be better off than a similar household outside London with lower rent costs. The BHC measure also means that a household will appear to be better off if their rent increases, thus increasing the amount of housing benefits they receive, although their disposable income remains unchanged. Moreover, an increase in rent for those not receiving housing benefits means a fall in their disposable income, which is also not captured by the BHC measure. We therefore use the AHC measure throughout this report as it offers a more accurate picture of how poverty varies across the capital and compares with the rest of England. 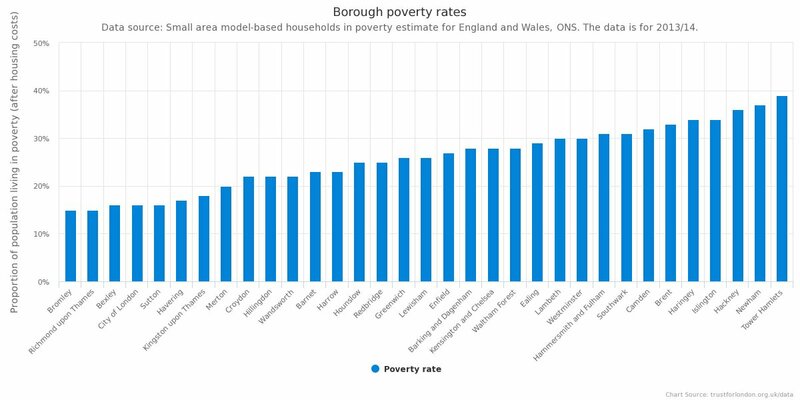 Housing costs play a large role in explaining higher rates of poverty in London than the rest of England. Before we account for housing costs (the BHC measure), London had a lower poverty rate than the rest of England at 14% compared with 16%. However, once housing costs were accounted for, London’s poverty rate was six percentage points higher than the rest of England. Previously, London and the rest of England had similar rates of poverty before housing costs. For the last few years, London’s BHC rate has been lower. Despite the poverty rate falling over the last few years, there is some evidence that depth of poverty is increasing, i.e. those in poverty might be facing deeper disadvantage. One measure of this – whether household income is below 50% of the median income rather than 60% – is increasing in London. This poverty rate has increased by 1.5 percentage points in the last five years. * Padley, M., Davis, A., Hirsch, D., Horsley, N., Valadez, L. 2017. A Minimum Income Standard for London, 2016-17. London: Trust for London.